We've seen this story before in the stock market: Oil prices are up as a Middle East conflict escalates, and the markets are sliding. 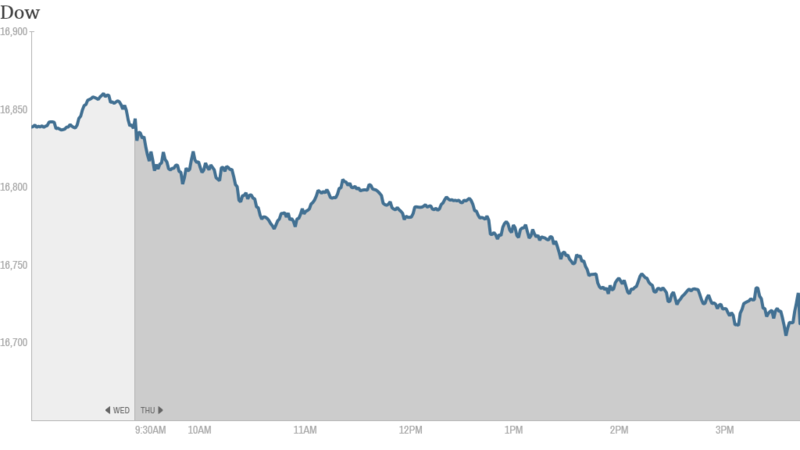 The Dow Jones industrial average fell nearly 100 points (0.65%). The S&P 500 and the Nasdaq both sank over 0.7%. The selling adds to losses from the previous day. Stocks fell Wednesday after the World Bank lowered its outlook for global economic growth and House Majority Leader Eric Cantor lost his re-election bid. Now the focus is Iraq. Investors watch Iraq: Oil prices jumped more than 2% as Iraqi forces battled Islamist militants for control of the nation's second-largest city. Crude futures on the New York Mercantile Exchange rose above $106 per barrel, a high not seen since Sept. 2013. The brazen attack by fighters from a group called ISIS is making commodity traders nervous as they consider how the turmoil could affect the country's large oil-producing areas. While the fighting in Iraq probably won't derail the market, "It is enough to trigger some position-trimming and a pause," said Kit Juckes, a strategist at Societe Generale. Worries about higher oil prices hit the airline sector particularly hard. Delta (DAL), South West (LUV) and United Continental (UAL) were down more than 5%. What's moving -- yoga, Tesla, Intel and furniture: Shares of Lululemon (LULU) plunged almost 16% after the maker of yoga apparel lowered its earnings outlook for this year. The company's board also approved a plan to buy back $450 million worth of stock, but that didn't appear to be helping much. Lululemon also announced that its chief financial officer, John Currie, will retire at the end of this fiscal year. On Wednesday, Chip Wilson, the yogawear company's founder and largest shareholder, said he voted against the re-election of two of the company's board members. The sell-off raised speculation on StockTwits that Lululemon could be a takeover target. But one trader said the stock will need to fall further before a sale would make sense. "$LULU needs to be back in the 20's for it to be even remotely interesting as a buyout candidate. $6B simply too much for a yoga pant maker," read a post by AgentZero. Shares were trading around $37 on Thursday. Intel (INTC) is up after the closing bell after announcing better second quarter and 2014 revenue expectations. The company says demand is "stronger than expected for business PCs." Shares of Tesla Motors (TSLA) turned lower after CEO Elon Musk announced that the company will not file patent lawsuits against competitors who use the company's electric car technology "in good faith." Restoration Hardware (RH) shares soared more than 13% after the company reported earnings that beat analyst expectations. It's the latest luxury brand benefiting from increased consumer spending at the high end. Tech stocks shuffle as key executives move around: Twitter (TWTR) shares rose 3.5% after the social media company said its chief operating officer, Ali Rowghani, had resigned. Twitter has struggled -- it's down over 41% this year -- but several analysts upgraded the stock this week. Infosys (INFY) slid about 2% on news that a new CEO was appointed to lead the IT services company. Latest economic news: The government said retail sales rose 0.3% in May, falling short of what economists had forecast. Separately, the number of Americans filing first-time unemployment claims rose more than expected, according to the Labor Department's weekly report. Still, many are likely to be more interested in the World Cup, which kicked off at 4 p.m. ET. The tournament in Brazil is expected to be the most watched sporting event ever, and Americans are becoming increasingly interested in the game. Brazil's stock market is up almost 1% today. European markets ended narrowly mixed. Asian markets mostly closed with losses, though Indian markets were buoyant.